Former pastor Rev. 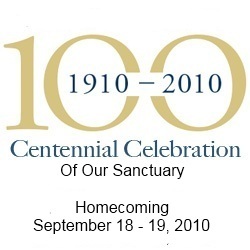 Bill Hurdle will be the guest speaker this Sunday at a very special homecoming celebrating the centennial of the present sanctuary at Hazlehurst First United Methodist Church announces Rev. Rodney Porter, pastor. Hurdle was pastor from 1963 to 1969. He and wife Betty have 4 children: Harriet, Caroline, Billy and John. He also served churches in Cordele, Moultrie and Mulberry Street in Macon. For 11 years is was Executive Director of the Georgia Commission on Higher Education and Campus Ministry. For the past 13 years he has been chaplain of Wesleyan College in Macon. He is a graduate of Emory Univesity and has a honorary doctorate from Lagrange College. On Saturday from 12 pm to 5 pm a Fun Day will include food, water slide, activities and games for all ages. Gospel singing will begin at 2 pm in the Frazier Youth Center. Some groups that will be singing are the James Benjamin Family, John & Rose Hunt, Brian Sellers, Kyle Sellers, Bill Summerlin, Brooks Hughes "AND many more of your favorites" announces Jeffery Spell, minister of music. Sunday's celebration service begins at 10:30 am with worship in the church's 100 year old sanctuary. Built in 1910 the sanctuary is one of the oldest buildings in Hazlehurst.